The Scrap Buyers and Sellers section of the board is for buyers and sellers to advertise, network and make money together. This section of the forum contains products and services offered by members. 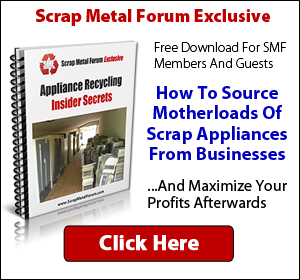 The products, services offered here are not associated with, affiliated with, endorsed or sponsored by, nor have the products and services offered here been reviewed, tested or certified by the Scrap Metal Forum, it's owners, associates, affiliates, or moderators. In order to advertise as a buyer and/or seller in this forum, you MUST upgrade your membership and start your own thread. Posting buy or sell offers on the public forum, or on other people's threads is absolutely not allowed. To upgrade your account to obtain the ability to advertise in the Buyers & Sellers section, VISIT YOUR PAID SUBSCRIPTIONS PAGE HERE. 1 - If you have any questions or concerns regarding an offer posted, ask the owner of the advertisement before you buy or sell. The buyer or seller's history on the forum, their profiles, and what has been posted by them in the past is available for you to research and evaluate. 2 - Please feel free to post reviews if you've had experience with a buyer or seller advertising here. Since the forum does not review, recommend, or confirm the products or services offered, and disclaims all responsibility for whether or not their advertisements are accurate and that the advertiser will hold up to their end of the bargain, your truthful evaluation, experiences and opinions are important for other members who may be considering dealing with a buyer or seller. 3 - You must give our members (your potential customers) some reliable and common way to contact you which is not dependent on the forum or it's features/functionality. An email address and/or phone number for example. Many members, such as new ones, and guests, who might be interested in dealing with you might not have enough posts or privileges to send or receive private messages. 4 - Although a Scrap Room Membership gives you the ability to post a buyer or seller ad, the forum staff still solely decide what is and isn't allowed or approved. There may be times when we might not allow certain advertisements or offers, or that any advertisement or offer will be discontinued. 5 - Anyone caught scamming or deceiving members here will lose posting privileges (obviously), and possibly removed from the forum entirely. If you're going to place an advertisement here it's your responsibility to maintain a good reputation and morals. If you can't handle or don't want the business coming in, submit a support ticket and ask that your thread be closed. 6 - If you do in the rare case, have an issue with a member who has posted an advertisement here, the issue is between you and them, not the forum, not the mods, not the forum owner or admins. However, we do encourage that you make us aware of any issues via a support ticket. You can also use the 'report' feature to report threads, the triangle icon at the bottom left hand corner of the first post will let you send a report to the forum admins and moderators. 7 - DO NOT ... I repeat DO NOT advertise on somebody else's thread. DO NOT post an offer to BUY anything on another BUYER'S thread. If you want to advertise, make payment to the forum then post your own thread! Failure to follow this rule may very well result in a BAN or a removal of your current advertisement if you have one (without refund)! 8 - Any advertisements acting as a 'broker' or 'affiliate' are not allowed. If you yourself are not providing the service/offer presented in your thread, don't post it. Last edited by admin; 03-10-2014 at 07:02 AM. UPDATE - Read entry #7 in the guidelines above! Failure to follow that rule may very well result in a BAN or a removal of your current advertisement if you have one! I have paid for my subscription so now how can I post a new thread to buy? Just click the 'New Thread' button at the top of the forum. Just had a quick question regarding #7 - Is it ok to post an offer to buy something on someone else's thread if they are not a buyer? Not that I do this often (or at all) just want to make sure that I understand the rules for some day when they will apply to me. Julie, any offer to buy or sell will be deleted unless it is on the Buyers and Sellers forum. Such offers can be reported using the "!" button since we don't catch them all. Ahhhh, that xplains it. Thx Y'all!